Eighteen months ago, Dan and I took a big (and some would say “crazy”) leap by moving from the house where we raised our girls to “the country”. Okay, it’s really just down the highway a bit to Hanover, MA, and not to Oklahoma! We managed to start downsizing (a “limited downsizing”), bought a fixer-upper, and started out on our “Next 10 Adventure”. We’re filling our years between 55 and 65 with new routines and challenges. Here’s a list of some of 10 things we’ve learned so far on our adventure. 1. Two cars can really fit into a 2-car garage (who knew?!). 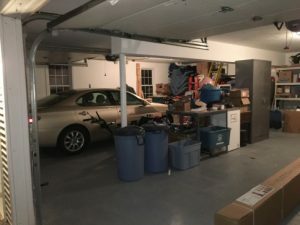 We had a 1-car garage in our previous house. During the winter, we parked my minivan in the garage, but Dan’s car was outside braving the harsh New England winters. Our “Next 10” house has a bonus—a 2-car garage. It was shocking how fast we filled that garage with everything that didn’t have a place in the new house. With the threat of an impending snowstorm, we had to scale back even further. Some of our stuff went to the shed out back, but the bulk was donated to the Salvation Army. Some items landed in the dumpster that seemed to have a permanent parking place in our driveway. At the end of our hard work, we discovered that both cars fit into the garage! There is still more organization and clean up to do in that space, but it is nothing short of a miracle that we downsized enough to get the cars in to that space. We’ve got one car in the garage and just a few more items to move for the other to fit. Almost a miracle! 2. After planting truck-loads of flowers, we didn’t even make a dent in the acre lot. One reason for wanting a bigger yard was gardening. We love to have blooming flowers and bushes and trees from April to November, and wanted more of them. Our intension was to venture into vegetable growing – yep, a “farm”. First thing this spring, we found a local nursery and bought more plants than we ever had before. 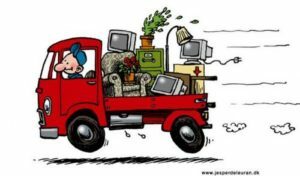 Five, six, seven trips to the nursery while filling the minivan to capacity with all the seats folded down, and what happened next? We planted for days and days. The result: “Didn’t we plant anything?” Turns out we’ll need years to plant and design an acre-sized yard. It was funny to look out after weeks of gardening and feel somewhat disappointed. It was a “Where’s the beef?” moment of living in the country. But we’re still game. We’ll start planting all over again this spring and maybe it will look like we have the start of a real garden underway! 3. Have a “meet & greet”. It can feel rather odd to move into a new neighborhood when you don’t have any school-aged children. Schools provide both a natural social network and a center of resources that engage you into your new town. Dan and I didn’t have that foundation with this move. 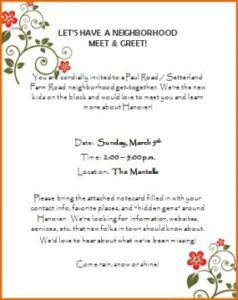 So— we hosted our own “meet & greet” party for the entire neighborhood after we completed the majority of the reno. People are naturally curious what’s been going on with “those new folks” and rather than having them peer in the windows, why not just open the door? Let them see. Meet and greet. It was great fun and we met lots of our neighbors. 4. You can stay connected to your old town. When you set out on an adventure, you often think it’s far away and exotic. It doesn’t have to be that way. We needed to limit the scope of our move to within a 30-mile radius of Boston. Turns out that our move held a bonus: it’s easy for us to stay connected to our former town, especially with our friends who are so special to us. Sure, it takes a half an hour to get there and we have to make more specific plans. Yet, it’s easy because we are not far away. It’s a quick drive for our friends to come hang out with us in the country, too! If you see green eyes in the dark, it’s probably a wolf. Wildlife out in the “country” looks different and much larger than near a big city. At first, I thought we had a badger in the backyard… laugh at me…it was a woodchuck. Bunnies and baby bunnies ate every single top off my newly planted dahlias. No wonder our planting effort was looking rather sparse! We pulled into the driveway on a chilly November night and the headlights caught a pair of green eyes gleaming from the backyard. Scary? Yes! I was sure it was a wolf. Dan assured me it was not a wolf, but probably a fox or coyote. I’m not buying it! I now have to be on alert for my furry “friends” when I pull in the driveway. Good thing my minivan fits into the garage! 6. There really is a Dunkin Donuts (DD) on every corner no matter where we live. Turns out the original DD is a few miles up the highway from us. To say that DD dominates the Boston metro area is an understatement. There are 8,500 DDs across most of America—over 1,000 here in Massachusetts. It’s no surprise that there are 5 DDs within a 5-minute drive from our new house, and probably 50 within a 10 minute drive. But, our favorite DD is in the Home Depot! We’ve been known to arrive at Home Depot on a Saturday at 7 a.m. and have a tailgate DD breakfast before picking out paint or buying more hinges. Yep, it’s renovation love. 7. It sometimes takes a few tries to get the right construction team. With our new commitment to a home that needed extensive work, we had to get on board quickly to find a team of great trade professionals to help us with our renovations. We moved far enough away that most of our former building resources were no longer available. Thankfully, our painter and home repair guru was accessible. We found our super cool electrician from a chance conversation with a guy at Home Depot. (Really, Home Depot is the place to go for more than a cup of coffee!) It took a few tries to get a plumber who worked well for us. Turns out many of the heating oil companies have plumbers on staff. We even tried HomeAdvisor.com to look for a contractor who would do a couple of bathroom remodels. That worked out well and we now have a terrific shop that does smaller jobs and excellent tiling. Finding the right help can take a few tries, but when it works, you have a team in place for anything else that crops up over the years. 8. Make U-turns in the middle of the road. One of the main reasons we set off on our “Next 10 Adventure” was to find new things to do and explore a whole different area of Massachusetts. But, it’s easy to get caught up in the day-to-day stress of our jobs, not to mention 18 months of renovations. So, we made a commitment to get out and about especially in the summer to explore the area. We’d run errands and found ourselves saying, “Hey, I wonder what’s down that road?” Instead of wondering, we’ make a U-turn (sometimes right in the middle of the road) and go find out. There are hidden treasures everywhere. It doesn’t hurt to make some of our explorations around new restaurants, either! Now that the reno is done, we’ll do a lot more weekend wanderings. 9. You can live with less. It is hard to believe that we are surviving just fine with half the stuff we had 18 months ago. We downsized the most in the kitchen and dining room. Clothes, the girl’s “artwork”, and Dan’s wood stockpile and tools were not easy to part with. But really, those t-shirts from grad school had to go! We made an agreement that if we tossed or gave away anything that turned out to be something we needed; we’d go buy it again. Problem solved. And, if it was a tool or piece of wood, Dan could say to me, “See, I told you so. I knew I would need that someday.” I was willing to take that big risk! So far, there have only been one or two tools that Dan did need to repurchase. He gets yet another trip to Home Depot and a newer version of his necessary gadgets. It was well worth the effort to let go. 10. Home is where the heart is. We know this logically, but it’s good to be reminded every now and again. It isn’t about the stuff. It’s about the family, the people, and our pets. We hosted Thanksgiving at our daughters’ apartment this year in Minnesota. While it was far away, it was still home because we all were there. Later, we enjoyed Christmas in our newly renovated house with almost all of the extended family around the table. It wasn’t the house where we raised the girls, but it’s home. The physical space feels different, but the family stories and making new memories are what we’ve always done and will continue to do. From the heart, it’s always home whenever and wherever we’re together. We’re sure there are more adventures for us as we wrap up the renovation. Here’s to finding new beaches, trying new restaurants, hanging with our daughters wherever they land, and getting more involved in our new community while keeping in touch with our former home town friends. 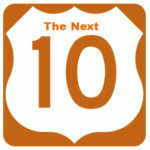 Look for more of our “Next 10” update in future blog posts. And, please share yours!